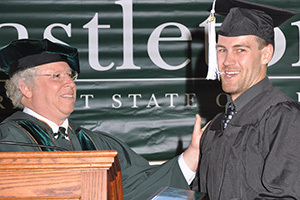 To earn an Associate’s degree, a student must complete the General Education requirements, satisfy specific degree program requirements, and earn a minimum of 64 credits of which at least 15 credits must be earned at Castleton. A minimum cumulative GPA of 2.0 is required for graduation. If chosen carefully, the Associate's Degree work can be smoothly transferred into a Bachelor's Degree program if students decide to continue their studies. While Castleton's Associate's and Bachelor's Degree programs are normally completed in two and four years, respectively, Castleton does not guarantee that all students will necessarily be able to complete their chosen degree programs in these time frames.